Asikkala is a municipality of Finland. Explore the numerous day-trip ideas around Asikkala: Porvoo (Cathedral of Porvoo, Kokonniemi, & more), Espoo (Nuuksio National Park, Serena Water Park, & more) and Kouvola (Repovesi National Park, Tykkimaki Amusement Park, & more). 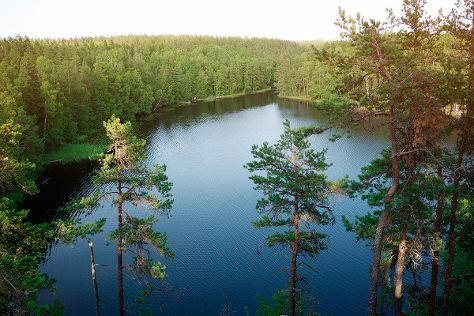 Spend the 15th (Thu) exploring nature at Leivonmaki National Park. Spend the 18th (Sun) exploring nature at Valkmusa National Park. The adventure continues: take in nature's colorful creations at Sapokka Water Garden, examine the collection at Ainola - The Home of Aino and Jean Sibelius, admire nature's wide array of creatures at Maretarium, and get into the urban bustle at Sibelius Hall. Start your trip to Asikkala by creating a personalized itinerary on Inspirock. In October, plan for daily highs up to 8°C, and evening lows to 1°C. Wrap up your sightseeing on the 19th (Wed) to allow time to travel back home.